You don’t own a hot tub? We’ll teach you what you don’t know! Most popular time to take a soak? Owners: Half of the owners soak during the weekend and after work. 45% said just before bed, while 10% favored the first thing in the morning. Non-owners missed the mark by a wide margin when asked how popular they believed the end and beginning of the day were. As for frequency of use, almost 17% of the owners soak a minimum of four times a week, and 8.9% use their hot tub every day. The main reason for owning a hot tub? 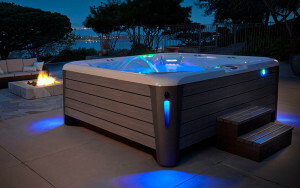 Owners: 84% believe relaxation and stress relief are the reasons for owning a hot tub, and one-third said they slept better. 50% felt that soaking helped them recover from injury. Non-Owners: a smaller majority of non-owners, 66%, felt the same about relaxation and stress relief, but only 20% expected to sleep better. And just one-third of the non-owners believed a hot tub would improve post-exercise recovery. The same percentage of both groups (20%) felt a hot tub would help recuperation from injury. Will owning a hot tub increase family time? Owners: 42% of owners said that is exactly how they spend their time in the hot tub. Non-Owners: only one-quarter of non-owners thought a hot tub would bring them closer to their families. Digging a little deeper, the survey found that 60% of the owners spent time in the hot tub with their spouse, 20% listed their children, and 15% chose to go it alone. Is the addition of a hot tub a worthwhile investment in your home? Owners: 13% of the owners believed their hot tub was a valuable investment. Non-Owners: Only half as many non-owners felt the same way. Don’t know much about hot tubs? Want to know more? With over 27,000 hot tubs sold since 1977, we have a lot of stories and experiences to share. But don’t take our word for it, visit any one of Olympic Hot Tub’s convenient Puget Sound showrooms, and experience for yourself how wonderful hot tubbing can be! A free test soak awaits you! Using the hot tub right after exercising is actually not recommended. You should allow plenty of time to cool down first so it does not add any additional strain to your heart. Soaking in the tub after straining a muscle or joint will not help either. The heat of the water will draw blood to the injured area and this could make it swell even more. Instead you should apply ice to the injured area as soon as possible and wait a couple of days before getting in the tub. Both great points. Yes, absolutely cool down before getting in the tub after a workout. Thanks for the the tip. A short hot tub session before exercise can alleviate stiffness giving you a better workout.